How To Get A Work Visa For Kuwait. If you are interested in relocating to Kuwait in order to find employment, you will need to know how to get a work visa for Kuwait in order to live and work legally in the country. In this article, you can find out all the information that you need to know in order to make your application go as smoothly as possible. To be permitted to reside and work within Kuwait, overseas applicants must obtain an iqama, or residency visa. This is only possible if you have already been offered a job in Kuwait, either by a government organization or by a private company. Once you have been offered a post, your new employer can then apply for the residency visa on your behalf. Once this has been done, you will be issued with a NOC or No Objection Certificate which will entitle you to enter the country. Once you have entered the country, you will be issued with your residency visa as long as you meet the other essential criteria including the medical testing element. You can only be granted a maximum period of five years residency after which you will be required to renew your application. You will be charged a fee of KD 10 per year, however if you will be working for a government organization, your employer will pay this amount for you. If you will be working for a private company, you will need to negotiate whether you will bear the cost or whether you new employer will be prepared to cover the amount on your behalf. If you wish to apply for a Kuwait work visa, you will require a current passport with at least three months unexpired validity on it. It will also require a minimum of one empty page to receive your visa. You will also have to send one passport photograph of yourself which meets all of the required guidelines. You will also need to supply a police clearance from your home country stating that you have a clean criminal record and that there are no restrictions on you leaving your own country of origin. You will, of course, also have to submit a completed and signed visa application form. In order to be issued with your residency visa, you will have to pass certain medical tests to show that you have no communicable diseases. As part of this testing, you will have to have an HIV test as well as tests for Hepatitis B and C, tuberculosis, syphilis, typhoid, malaria and filariasis. You will also need to have a certificate of health from a local doctor which states that you are in good physical health and that you have no contagious diseases of any sort. You will also receive a vaccination to protect you against meningitis. You will receive the results of these tests within a week, however if you are found to have any of these diseases, you will be deported out of the country. If you have a negative result in all of the tests, you will receive a letter confirming your health clearance from the Ministry of Public Health and once you have received this health clearance, you can then be issued with your residency visa. Once you are in receipt of your residency visa, the next step is to apply for a bitaqa-almadaniyah or Kuwaiti Civil ID. You must submit your application for this within thirty days of being issued with your residency visa. A man who has been issued with a residency visa can then apply for his spouse and dependents to join him in Kuwait, acting as their sponsor; however a woman cannot act as a sponsor on behalf of her husband. 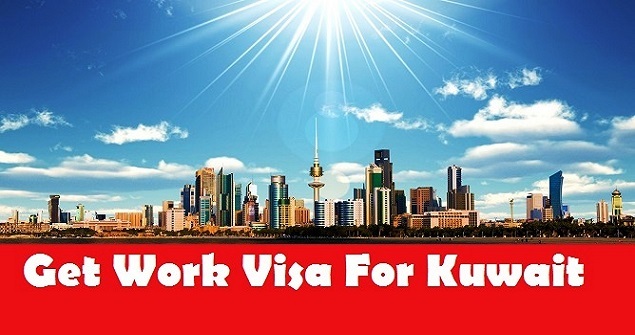 How to Get a Work Visa for Kuwait. Expatriates must obtain security clearance and have their fingerprints taken before legally being able to reside in the country. In order to have their fingerprints registered with the authorities, applicants must have their original passport and a copy of it as well as 4 passport photographs and a letter issued by the Ministry of Social Affairs and Labor. The necessary application form has to be completed in Arabic, however if you do not know how to do this yourself, you can hire the services of a freelance typist who can complete the form for you for a small fee. The processing of your fingerprints will take around a week after which your security clearance certificate will be issued by the Criminal Evidence Department at the Ministry of the Interior. You will need to collect your certificate in person from one of the four offices at which your fingerprints were taken.